DO use the subject line and be succinct, accurate and precise. DO open with a professional salutation (Dear Robert, Good morning Jane, Hello David, etc.). DO be concise. Get to the point and try to focus on one subject per message. If you have questions it's helpful to use bullets. DON'T use all caps in emails. Some readers will take all caps as yelling. DON'T use abbreviations in work emails - leave that for texting. For example, instead of saying "lv a msg on my vm" say "Leave a message on my voicemail." DO end an email with a professional closing. You should have a closing followed by a comma with your name underneath. Safe options include Thank you, Sincerely or Many thanks. Non-professional closings include Over and out, Cheers, I remain yours truly, etc. DO create a professional signature that includes your name, title, organization, telephone number and possibly work website. The signature should go right below your text in all communications so you can be easily contacted. DO think carefully about who you are addressing your email to. CC = People that are indirectly affected but need to be in the loop. BCC = Use for group emails to protect recipient privacy. DON'T use BCC as a way to keep others in the dark as to who else is reading the messages. DO avoid cluttering others' email by sending emails to too many people. DON'T forward junk mail or use "reply all" - it's just annoying! DO think about your tone. Sarcasm can be misunderstood as rudeness and use of emoticons - while helpful in expressing your tone - can appear unprofessional. DO make sure your message is clear and grammatically correct. Check for spelling, grammar, punctuation, capitalization and avoid over use of punctuation (?!?!). DO think before you hit "send." Remember that emails aren't private. Anything you send can be forwarded to others so don't send private information, gossip or slander others. DO make an effort to respond to emails within 24 hours. DO set up automatic replies when you are out of the office or on vacation and won't be checking email regularly. You don't have to give details about where you are but can simply say "Thank you for contacting me. I'll be out of the office between Monday, January 15 and Wednesday, January 17 with limited access to email. I will be in touch with you when I return to the office. Thank you!" Prepare beforehand and think about who you would like to meet and what you have to offer. You may be able to see who has RSVP'd and find points of interest ahead of time to help in striking up and continuing a conversation. When introducing yourself, extend your hand and say your first and last name. Do make sure you're not interrupting a conversation first! You might ask an open-ended question to get the conversation started (i.e. What did you enjoy most about today's workshop? How long have you been with XYZ company?). Conversation should revolve around the other person where you listen for the majority of the time. Use the person's name in conversation to help you remember it. Talk for several minutes but move on to meet others you would like to get to know. If you started the conversation with a handshake, close it the same way and say it was nice to chat with them. Put away your cell phone! It is distracting and makes you appear unapproachable if you're constantly in a corner texting up a storm. Do keep business cards easily accessible in your jacket pocket or purse. You may not give one to everyone you meet but if you've had a good conversation and want to stay in contact, exchange cards and follow up with them in the coming days. 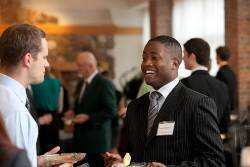 Forbes magazine shares 17 Tips to Survive Your Next Networking Event. It happens. Work gets stressful. Maybe a project is running behind schedule and one of your co-worker's research is full of mistakes. A good rule of thumb is to take time to calm down and think about the situation calmly. Don't fire off an emotional email or text or march into their office and start yelling. If there is a problem with a co-worker, it might help to schedule a time to sit down with them and discuss your concerns calmly. If the problem is persistent and is affecting the team's work it may be time to inform your supervisor. In-person conversations are always best but if email is necessary always be polite and concise in your message. Remember to be kind to those around you and show grace and forgiveness when needed.